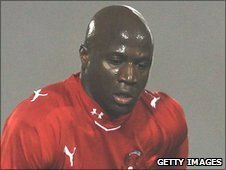 Jonathan Tehoue and Scott McGleish hit hat-tricks as Leyton Orient stormed back to end Droylsden's FA Cup dreams. The Bloods led through goals from Ciaran Kilheeney and Alex Brown as Orient's Terrell Forbes was sent off. Ben Chorley got one back and, following a red card to Nathaniel Kerr, Tehoue equalised before Chorley was dismissed. Paul-Jose Mpoku put the hosts ahead in extra time and, after Les Roche was sent off, Tehoue added two goals and McGleish three as Orient ran riot. An amazing encounter at Brisbane Road ultimately ended in more FA Cup heartbreak for the Blue Square Bet North side, who were thrown out of the competition for fielding an ineligible player after reaching the third round two seasons ago. They took the lead after seven minutes when Kilheeney prodded home, before Forbes was given his marching orders for a bad tackle on Jody Banim. Things got worse for the hosts when Brown pounced on rebound to double Droylsden's lead soon after the break, but Orient were given hope 15 minutes from time when Liam Brownhill upended Mpoku and Chorley despatched the resulting penalty. Droylsden's Kerr saw red for a foul on Alex Revell before Tehoue met Mpoku's cross to level the scores, Chorley seeing red shortly after for a second yellow. Mpoku's low drive put Orient ahead in the early stages of extra time and Droylsden faded badly when Roche was dismissed for his second booking. McGleish and Tehoue both scored from 18 yards within two minutes of each other and Tehoue completed his hat-trick from 20 yards out. Two close-range finishes in the dying moments sealed McGleish's treble and put further gloss on the night for Orient, who now travel to Norwich in the third round. 120:00+0:06 The match has ended. 118:37 Assist on the goal came from Jonathan Tehoue. 118:37 GOAL - Scott McGleish:Leyton Orient 8 - 2 Droylsden A goal is scored by Scott McGleish from inside the six-yard box low into the middle of the goal. Leyton Orient 8-2 Droylsden. 117:33 Inswinging corner taken by Charlie Daniels. 116:47 John Hardiker challenges Jonathan Tehoue unfairly and gives away a free kick. Charlie Daniels takes the direct free kick. Correction - 115:57 Charlie Daniels has an effort at goal from just inside the box that misses to the right of the target. 115:57 Charlie Daniels has an effort at goal from the edge of the box that misses to the right of the target. 114:04 Unfair challenge on James Walker by Jody Banim results in a free kick. Charlie Daniels has a direct shot on goal from the free kick, Paul Phillips makes a comfortable save. 113:35 Elliot Omozusi takes a shot. Save by Paul Phillips. 112:50 Shot from 12 yards by Domaine Rouse. Blocked by Elliot Omozusi. 111:16 The assistant referee signals for offside against Scott McGleish. Paul Phillips takes the indirect free kick. 110:18 Centre by Matthew Spring. 109:17 James Walker produces a right-footed shot from just outside the box that goes wide right of the target. 107:39 Charlie Daniels provided the assist for the goal. 107:39 GOAL - Scott McGleish:Leyton Orient 7 - 2 Droylsden A goal is scored by Scott McGleish from inside the six-yard box low into the middle of the goal. Leyton Orient 7-2 Droylsden. 107:20 Centre by Elliot Omozusi, Jonathan Tehoue takes a shot. Save by Paul Phillips. 106:12 Assist on the goal came from Matthew Spring. 106:12 GOAL - Jonathan Tehoue:Leyton Orient 6 - 2 Droylsden Goal scored by Jonathan Tehoue from just outside the area to the bottom left corner of the goal. Leyton Orient 6-2 Droylsden. 105:34 Jonathan Tehoue crosses the ball, clearance made by Colin Cryan. 105:00+1:46 Shot from 20 yards from Ciaran Kilheeney. Save made by Jason Brown. 104:51 Jonathan Tehoue delivers the ball, Ciaran Kilheeney makes a clearance. Outswinging corner taken by Charlie Daniels, clearance made by Colin Cryan. 104:12 Charlie Daniels crosses the ball. 103:59 Colin Cryan takes a shot. Save made by Jason Brown. 100:58 Aaron Brown challenges Domaine Rouse unfairly and gives away a free kick. Direct effort from the free kick comes in from Jody Banim. Correction - 100:10 John Hardiker concedes a free kick for a foul on Jonathan Tehoue. Aaron Brown takes the direct free kick. Correction - 100:10 Substitution James Walker on for Paul-Jose M'Poku. 100:10 John Hardiker challenges Jonathan Tehoue unfairly and gives away a . 100:10 Substitution (Leyton Orient) makes a substitution, with James Walker coming on for Paul-Jose M'Poku. 98:25 Assist on the goal came from Paul-Jose M'Poku. 98:25 GOAL - Jonathan Tehoue:Leyton Orient 5 - 2 Droylsden Jonathan Tehoue finds the back of the net with a goal from just inside the area to the bottom left corner of the goal. Leyton Orient 5-2 Droylsden. 96:47 Matthew Spring provided the assist for the goal. 96:47 GOAL - Scott McGleish:Leyton Orient 4 - 2 Droylsden Scott McGleish finds the net with a goal from the edge of the penalty area to the bottom right corner of the goal. Leyton Orient 4-2 Droylsden. 96:03 Charlie Daniels delivers the ball. 93:57 Lee Roche gives away a free kick for an unfair challenge on Paul-Jose M'Poku. Charlie Daniels takes the direct free kick. 93:57 Sent off Lee Roche is sent off by the referee. 93:00 Stephen Dawson provided the assist for the goal. 93:00 GOAL - Paul-Jose M'Poku:Leyton Orient 3 - 2 Droylsden Paul-Jose M'Poku fires in a goal from just outside the area to the bottom right corner of the goal. Leyton Orient 3-2 Droylsden. 92:03 The referee penalises Jonathan Tehoue for handball. Paul Phillips takes the free kick. 91:38 Free kick awarded for a foul by Lee Roche on Paul-Jose M'Poku. Free kick taken by Charlie Daniels. 90:59 Charlie Daniels decides to take a short corner, Effort from the edge of the box by Paul-Jose M'Poku goes wide of the right-hand upright. 90:44 Charlie Daniels takes a shot. John Hardiker gets a block in. 90:00+5:46 The whistle goes to signal the end of normal time, with extra time looming. 90:00+5:10 Scott McGleish crosses the ball. 90:00+3:06 Effort from deep inside the area by Paul-Jose M'Poku misses to the right of the goal. 90:00+2:04 Jonathan Tehoue takes a shot. Paul Phillips makes a save. Shot from 20 yards from Jody Banim. Save by Jason Brown. Corner taken by Liam Brownhill, Aaron Brown manages to make a clearance. 90:00+1:27 Paul-Jose M'Poku takes a inswinging corner. 90:00+1:27 Substitution Aaron Brown comes on in place of Alex Revell. 89:56 Foul by Ben Chorley on Jody Banim, free kick awarded. Strike comes in from Danny Gardner from the free kick. 89:56 Sent off Red card for Ben Chorley. 88:40 Assist on the goal came from Paul-Jose M'Poku. 88:40 GOAL - Jonathan Tehoue:Leyton Orient 2 - 2 Droylsden Jonathan Tehoue scores a goal from close range low into the middle of the goal. Leyton Orient 2-2 Droylsden. 88:26 Elliot Omozusi crosses the ball, clearance made by Mike Byron. 87:47 Effort from 25 yards by Paul-Jose M'Poku. Save made by Paul Phillips. 86:28 Inswinging corner taken by Paul-Jose M'Poku from the left by-line, Colin Cryan makes a clearance. 86:28 Substitution Colin Cryan replaces Lewis Killeen. 85:59 A cross is delivered by Stephen Dawson, clearance made by Mike Byron. 85:54 Paul-Jose M'Poku sends in a cross, clearance by Lewis Killeen. 84:55 Liam Brownhill gives away a free kick for an unfair challenge on Paul-Jose M'Poku. Charlie Daniels fires a strike on goal direct from the free kick. 84:55 Booking Liam Brownhill is cautioned by the ref for unsporting behaviour. 84:25 Shot by Jonathan Tehoue. Blocked by John Hardiker. 83:31 Nathaniel Kerr challenges Alex Revell unfairly and gives away a free kick. Matthew Spring takes the direct free kick. 83:31 Sent off The referee shows Nathaniel Kerr a red card. 82:28 Elliot Omozusi concedes a free kick for a foul on Jody Banim. Liam Brownhill takes the direct free kick. 82:28 Booking The referee shows Elliot Omozusi a yellow card for unsporting behaviour. 80:43 Paul-Jose M'Poku sends in a cross. 80:22 Matthew Spring crosses the ball, Danny Gardner manages to make a clearance. 78:52 Jody Banim fouled by Ben Chorley, the ref awards a free kick. Lee Roche crosses the ball from the free kick right-footed from right wing, save by Jason Brown. 78:52 Booking Ben Chorley is booked. 78:21 The referee blows for offside. Free kick taken by Matthew Spring. 77:42 Charlie Daniels produces a cross. 76:39 Unfair challenge on Paul-Jose M'Poku by Liam Brownhill results in a Penalty. 76:39 GOAL - Ben Chorley:Leyton Orient 1 - 2 Droylsden Penalty scored by Ben Chorley. Leyton Orient 1-2 Droylsden. 75:11 Booking Booking for Paul-Jose M'Poku. 74:43 The ball is swung over by Jonathan Tehoue, clearance by Lee Roche. 73:56 Scott McGleish produces a cross, clearance by Liam Brownhill. Outswinging corner taken by Paul-Jose M'Poku from the right by-line, Mike Byron makes a clearance. 72:29 Scott McGleish crosses the ball, Paul Phillips makes a comfortable save. 71:10 Substitution David McNiven goes off and Domaine Rouse comes on. 70:56 Liam Brownhill produces a cross, Ben Chorley makes a clearance. 68:46 Shot by Jonathan Tehoue. Save made by Paul Phillips. 67:15 Paul-Jose M'Poku crosses the ball, clearance made by Nathaniel Kerr. 65:55 Jody Banim takes a shot. Save by Jason Brown. 64:50 The ball is crossed by Alex Revell, John Hardiker makes a clearance. Inswinging corner taken left-footed by Charlie Daniels from the right by-line, Scott McGleish produces a header from inside the area that goes over the bar. 64:26 Jody Banim challenges Ben Chorley unfairly and gives away a free kick. Ben Chorley takes the direct free kick. 62:59 The assistant referee flags for offside against Ciaran Kilheeney. Jason Brown takes the indirect free kick. 62:39 Matthew Spring sends in a cross, clearance made by Nathaniel Kerr. 62:14 The ball is swung over by Charlie Daniels, Paul Phillips makes a comfortable save. 61:57 The referee blows for offside against Jody Banim. Jason Brown takes the indirect free kick. 61:46 Paul-Jose M'Poku sends in a cross, comfortable save by Paul Phillips. 61:26 Unfair challenge on Paul-Jose M'Poku by Nathaniel Kerr results in a free kick. Paul-Jose M'Poku restarts play with the free kick. 60:28 Substitution Mike Byron replaces Alex Brown. 60:17 The ball is delivered by Charlie Daniels, clearance by John Hardiker. 59:32 Elliot Omozusi delivers the ball, Lewis Killeen manages to make a clearance. 57:05 Drilled shot by Paul-Jose M'Poku. Outswinging corner taken left-footed by Charlie Daniels from the left by-line, Jonathan Tehoue takes a shot. Save by Paul Phillips. 57:05 Booking Paul Phillips booked for time wasting. 53:49 Jody Banim provided the assist for the goal. 53:49 GOAL - Alex Brown:Leyton Orient 0 - 2 Droylsden Alex Brown gets on the score sheet with a goal from close in to the bottom right corner of the goal. Leyton Orient 0-2 Droylsden. 53:01 A cross is delivered by Scott McGleish. 52:34 Drilled left-footed shot by Jody Banim. Save by Jason Brown. 52:02 Alex Revell gives away a free kick for an unfair challenge on Lewis Killeen. Paul Phillips restarts play with the free kick. 50:28 Corner taken by Liam Brownhill from the left by-line played to the near post, clearance by Matthew Spring. Inswinging corner taken right-footed by Liam Brownhill from the left by-line, comfortable save by Jason Brown. 49:07 Free kick awarded for an unfair challenge on Stephen Dawson by David McNiven. Elliot Omozusi takes the direct free kick. 47:41 Effort on goal by Jody Banim from 35 yards went harmlessly over the target. 47:04 The ball is sent over by Stephen Dawson, Nathaniel Kerr makes a clearance. 46:34 Jonathan Tehoue sends in a cross, Lee Roche manages to make a clearance. 45:01 Substitution Jonathan Tehoue joins the action as a substitute, replacing Jimmy Smith. 45:00+3:08 It is the end of the first-half. 43:11 Shot from just outside the box by Lewis Killeen misses to the right of the goal. 42:24 Effort from just outside the area by David McNiven goes over the target. 41:21 Charlie Daniels sends in a cross, John Hardiker makes a clearance. Corner from the right by-line taken by Paul-Jose M'Poku, Header from deep inside the penalty area by Ben Chorley goes harmlessly over the crossbar. 39:43 The official flags David McNiven offside. Indirect free kick taken by Jason Brown. 39:15 The ball is sent over by Charlie Daniels, save by Paul Phillips. 38:36 Scott McGleish is ruled offside. Paul Phillips restarts play with the free kick. 38:30 Jimmy Smith delivers the ball, John Hardiker makes a clearance. 37:36 Liam Brownhill takes the chance to get an effort at goal. Comfortable save by Jason Brown. 36:25 Foul by Terrell Forbes on Jody Banim, free kick awarded. Lewis Killeen takes the free kick. 36:25 Sent off Terrell Forbes receives a red card. 34:11 Free kick awarded for an unfair challenge on Jody Banim by Ben Chorley. Direct free kick taken by Nathaniel Kerr. 32:28 Scott McGleish takes a shot from 25 yards. Comfortable save by Paul Phillips. 32:10 Danny Gardner gives away a free kick for an unfair challenge on Charlie Daniels. Matthew Spring takes the free kick. 30:59 Ciaran Kilheeney gives away a free kick for an unfair challenge on Paul-Jose M'Poku. Free kick crossed left-footed by Charlie Daniels, Nathaniel Kerr manages to make a clearance. 30:01 Alex Revell is penalised for handball and concedes a free kick. Paul Phillips restarts play with the free kick. 29:10 Paul-Jose M'Poku sends in a cross. 28:47 Corner taken short by Charlie Daniels. 28:40 Elliot Omozusi crosses the ball, John Hardiker manages to make a clearance. 26:53 The ball is sent over by Paul-Jose M'Poku, Liam Brownhill makes a clearance. Corner from the right by-line taken by Charlie Daniels, Alex Revell takes a shot. John Hardiker makes a clearance. 20:54 Jimmy Smith takes a shot. Clearance made by Nathaniel Kerr. Inswinging corner taken by Charlie Daniels from the right by-line, clearance by Lee Roche. 19:19 Unfair challenge on David McNiven by Elliot Omozusi results in a free kick. Free kick taken by Liam Brownhill. 18:58 The ball is swung over by Stephen Dawson, Scott McGleish takes a shot. Save made by Paul Phillips. 17:30 Jody Banim takes a shot. Save by Jason Brown. Inswinging corner taken right-footed by Liam Brownhill played to the near post, clearance by Alex Revell. 16:06 Alex Brown produces a drilled right-footed shot from 25 yards. Save by Jason Brown. Centre by Alex Revell, Paul Phillips makes a save. 14:33 Drilled left-footed shot by Paul-Jose M'Poku. Lee Roche gets a block in. Charlie Daniels takes the outswinging corner, Scott McGleish takes a shot. 13:55 Charlie Daniels sends in a cross, Paul Phillips makes a save. 13:08 A cross is delivered by Elliot Omozusi, Paul Phillips makes a save. 11:15 The offside flag is raised against Ben Chorley. Indirect free kick taken by Paul Phillips. 10:30 Paul-Jose M'Poku fouled by Lee Roche, the ref awards a free kick. Free kick taken by Charlie Daniels. 10:30 Booking Lee Roche is cautioned by the ref for unsporting behaviour. 10:17 A cross is delivered by Elliot Omozusi, Nathaniel Kerr manages to make a clearance. 8:31 Paul-Jose M'Poku fouled by Jody Banim, the ref awards a free kick. Direct free kick taken by Charlie Daniels. 7:43 The ball is crossed by Liam Brownhill, Effort from close in by Ciaran Kilheeney goes wide left of the target. 7:23 Elliot Omozusi is penalised for a handball. Free kick taken by Liam Brownhill. 6:46 Elliot Omozusi fouled by Alex Brown, the ref awards a free kick. Direct free kick taken by Elliot Omozusi. 5:51 Assist by David McNiven. 5:51 GOAL - Ciaran Kilheeney:Leyton Orient 0 - 1 Droylsden Ciaran Kilheeney fires in a goal from close range to the top left corner of the goal. Leyton Orient 0-1 Droylsden. 4:58 Scott McGleish has an effort at goal. Alex Revell produces a header from deep inside the six-yard box which goes wide of the right-hand post. 4:09 A cross is delivered by Paul-Jose M'Poku, Alex Revell takes a shot. Save by Paul Phillips.